High school teachers seem locked in time to us; we seem like part of a flowing stream to them. My teachers are frozen in the late 1950s, an innocent time when high school portals had quotations from Milton carved over the doorways, and no metal detectors. But to them, the Class of 1960 was one of 10, 20, 30 or more classes passing through their hands, and even though Coach Smith did assure us at our 10th reunion that "there was never another class like you," we had the suspicion that he said that at all the reunions. As the movie opens, Holland (Richard Dreyfuss) and his wife Iris (Glenne Headly) are a couple fueled by his heady ambitions. He will be a great composer, of that he is sure, but then hard financial realities make him take the teaching job, where the hard-edged principal (Olympia Dukakis) looks him over sternly and reads him as a man for whom teaching has no seriousness. God knows the school needs a music teacher. At his first meeting with the high school orchestra, he finds they play badly. How badly? I didn't recognize the first four notes of Beethoven's Fifth Symphony. somewhat more muted pleasure -- which turns to coldness when he discovers his son, named Cole, is deaf. Holland almost takes it as a personal affront that his son will not be able to hear the great opus that he still clings to as his ultimate vision. show biz, and who falls in love with Mr. Holland, who must walk a delicate emotional tightrope with an end not always in sight. Although much of the movie involves Mr. Holland helping his students to mature, the character of the son, Cole, provides acounterpoint: A way for Mr. Holland to grow up, too, and accept bothhis son and his life. Some of them scenes between them are painful, and a later scene, where Mr. Holland sings John Lennon's "Beautiful Boy" to Cole, is very moving. Richard Dreyfuss, who is sometimes too exuberant, here finds theright tones for Mr. Holland, from youthful cocksureness to the gentleinsight of age. His physical transformations over 30 years are alwaysconvincing. Glenne Headly has a more thankless role as his wife, but watch her handle the scene where she suddenly sees something she had not suspected, and intuitively knows how to deal with it. The supporting cast is all strong, especially Jay Thomas as the football coach who becomes Holland's lifelong friend. Hynes, who taught us Shakespeare, always addressed us as "Mr." and "Miss," as a college teacher would do, and somehow that brought a greater seriousness to "Macbeth" and "Julius Caesar," which were uncharted new worlds for us. Modifying the curriculum to make it more "contemporary" and "relevant" is doing an injustice to students, whose lives will become relevant to the exact degree that high school encourages them to outgrow themselves, and escape from the contemporary into the timeless. Mr. Hynes knew that. 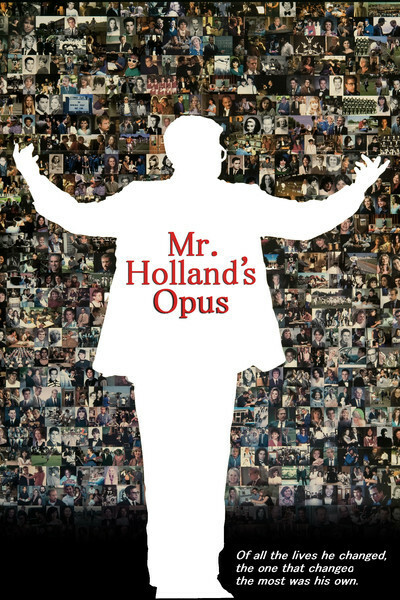 So does "Mr. Holland's Opus."